Manama, Oct.3 (BNA): His Majesty King Hamad bin Isa Al-Khalifa today received, at Shaikh Hamad Palace, a group of businessmen and traders. His Royal Highness Prime Minister Prince Khalifa bin Salman Al Khalifa issued and His Royal Highness Prince Salman bin Hamad Al-Khalifa, the Crown Prince, Deputy Supreme Commander and First Deputy Premier attended. Manama, Oct.3 (BNA): His Majesty King Hamad bin Isa Al-Khalifa today received, at Shaikh Hamad Palace, a group of businessmen and traders. 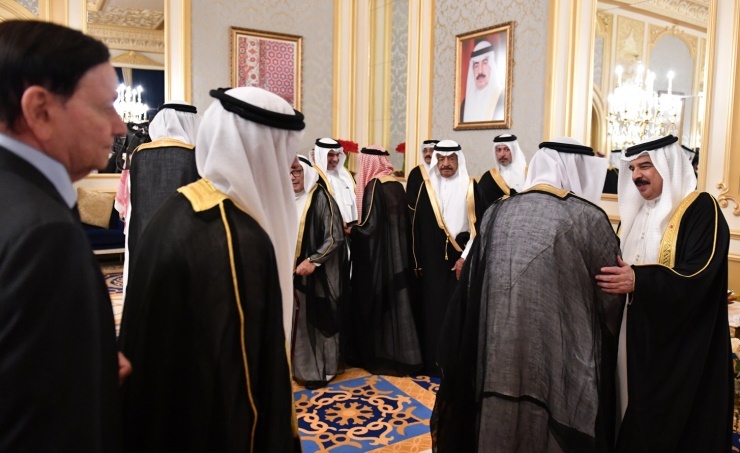 His Royal Highness Prime Minister Prince Khalifa bin Salman Al Khalifa issued and His Royal Highness Prince Salman bin Hamad Al-Khalifa, the Crown Prince, Deputy Supreme Commander and First Deputy Premier attended. HM the King welcomed the current and former chairmen of the Bahrain Chamber of Commerce and Industry (BCCI), as well as traders and businessmen, hailing their role in laying solid foundations to contribute to national development and enable the commercial sector to thrive and gain completive edge in a fast-moving world. He commended the strenuous efforts exerted by His Royal Highness Prime Minister Prince Khalifa bin Salman Al Khalifa issued and His Royal Highness Prince Salman bin Hamad Al-Khalifa, the Crown Prince, Deputy Supreme Commander and First Deputy Premier, as well as the people of Bahrain. He commended the Kingdom of Saudi Arabia, the United Arab Emirates and the State of Kuwait for their supportive role, stressing Bahrain’s resolve to continue the development momentum. He underlined Bahrain’s success in making new energy discoveries, adding that the process of oil production, extraction, selling and refining would require some time, hailing Saudi Arabia, the UAE and Kuwait for supporting Bahrain’s development programmes in all fields. “The news are encouraging regarding the economic development and the upcoming parliamentary and municipal elections”, he said, adding that all parties are working strenuously to achieve Bahrain’s progress and prosperity in all fields. He commended the Government’s achievements to promote housing and educational services for citizens, hailing the partnership with the private sector in spearheading vital projects. HM the King stressed the importance of preserving national unity and solidarity and underline Bahrainis’ good reputation worldwide, pointing out the need to prepare coming generations to follow in the steps of fathers and forefathers and continue the march of development and progress. He underlined Bahrain’s resolved to continue dedicated efforts to spur growth, diversify the economy, achieve financial sustainability for the windfall of achievements to benefit all citizens. HM the King expressed thanks His Royal Highness Prime Minister Prince Khalifa bin Salman Al Khalifa issued and His Royal Highness Prince Salman bin Hamad Al-Khalifa, the Crown Prince, Deputy Supreme Commander and First Deputy Premier, hailing their strenuous efforts to optimize achievements and spur growth. He paid tribute to Saudi, UAE and Kuwaiti leaders for their support to maintain Bahrain’s financial stability, stressing solidarity and common destiny and strong fraternal relations. He hailed the contribution of the trade sector over past generations, underlining the role of the private sector as an essential partner in in spearheading national economic development. He underlining the crucial importance of cooperation and joint work to turn today’s challenges into opportunities in a prosperous tomorrow, voicing trust in the viable role of the private sector. HM the King underlined Bahrain’s strategic location which ensured its openness, since olden times, on world trade, hailing Bahrainis’ had-work and self-reliance, which enabled them to serve as role model to young generations.